Some Android sync software that come bundled with various devices are confusing and not easy to use, and downright sluggish most of the time. One such example is the Samsung "Kies" for the Samsung Galaxy Tab. Before I became aware of the presence of third party sync software for the Android Operating System, I used Kies exclusively for transferring my files to and from the Galaxy tab device. Thought the interface seems very simple, the operation is not as simple as it looked. As a matter of fact, I lost some data when I used cut and paste operation to transfer some files from my PC to the Galaxy Tab. I don't know what happened but when I checked the folders that I transferred from the PC to the Galaxy Tab. Only the folders were there but the file contents are nowhere in sight. I tried every possible means to retrieve the files but nothing happened. Even transferring my contacts from the PC to the Tab seems an eternity to happen. With my unhappy experience with the Kies, I decided to look for some sync software from the Android Market and I was not disappointed. 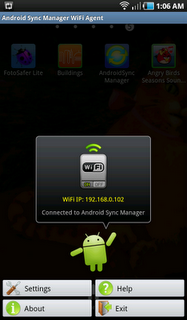 I stumbled upon this app called Android Sync Manager WiFi. The app seamlessly lets you transfer files to and from your PC and Android device without connecting via USB or bluetooth but rather thru WiFi. Navigating your files simultaneously across several devices is a breeze and the file transfer are done amazingly fast. Almost all kinds of files are supported by the app compared to the Kies which syncs only the photos , videos, music file and contacts. With the Android Sync Manager Wifi, I was able to finally transfer my collection of ebooks to the internal drive of the Galaxy Tab without having to pull out the Micro SD card or attaching the Tab to the PC via USB cable. All you need to do is download the PC version of the app here and Android version here. 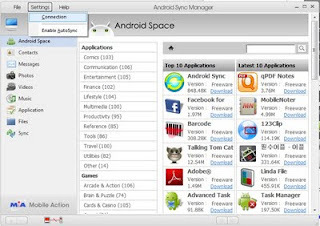 After downloading the versions, install first the Sync Manager on PC then install the Sync Manager on your Android Device. 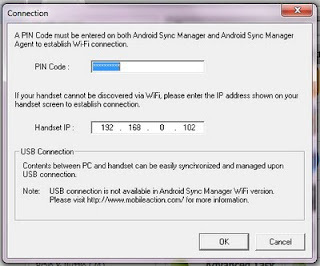 Upon successful installation on the device, run the Sync Manager and then proceed to the sync Manager Settings where you will take note of the PIN generated by the device. Run the Sync manager on the PC and click on Settings then click on Connections. 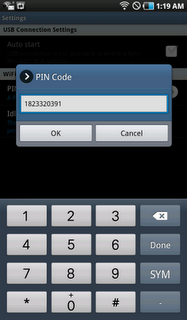 On the ensuing dialog box, input the PIN that you noted on Android device and then verify if the connection is established. You should see an animated icon of a PC and mobile handset at the bottom left side of the PC interface. If the connection is established, you will see a small circle with a check between the two icons. On the Android device meanwhile, you must see a picture of the Android character with a square speech balloon showing the IP Address of the host. As soon as you established the link between the devices, navigate your files on the PC interface and move files and sync to your heart's content.